PC gamers can be the first to return to Quadwrangle Manor with new content later this summer. 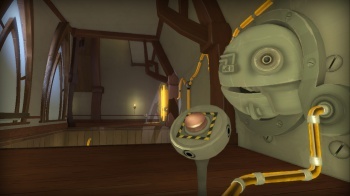 If you've already finished the first-person puzzler Quantum Conundrum, you'll soon have two new reasons to return to Quadwrangle Manor. Though the game has barely been out for a month on Steam and even less than that on consoles, Square Enix announced that it would be releasing two Quantum Conundrum DLC packs this summer: The Desmond Debacle and IKE-aramba! First up is The Desmond Debacle, which puts players in a new wing of the manor. Though the Professor often refers to his robotic drinking birds as Desmond, they were actually named after the manor's former butler. No matter what the title refers to, it's safe to assume that The Desmond Debacle will involve some button-pressing dimensional shifting. A few weeks after that, Square Enix will release IKE-aramba!, in which the player is tasked with rescuing the manor's Interdimensional Kinetic Entity, better known as the fluffy creature who can be spotted throughout the game. This content will also unlock a new area of the puzzle-laden mansion for players to explore. Like the game itself, the expansions will be released on PC first, followed by the console versions. The Desmond Debacle will be out on July 31 for Steam, August 14 for the PlayStation Network, and August 15 for Xbox Live. IKE-aramba! will follow on August 28 for Steam, September 11 for the PSN, and Xbox Live on September 12. Both packs will be $2.99.